Escape-rooms at Glade Springs resort are attracting players to a growing network of physical adventure games across the Mountain State, according to a spokeswoman for the luxury destination near Shady Spring. On the heels of the opening of its newest escape room, the Titanic, creative director Ashley Long says the resort is reaping and sharing benefits since pioneering the escape venue in the New River Gorge region two years ago. “Resort guests make up a large part of our audience here, though these adventures are open to everyone, and escape-room operators are sharing news of other venues to increase the attractiveness of West Virginia as a destination for team-building,” Long said. Popularized a decade ago in Asia, escape-rooms require a team of confined players to work together to solve puzzles that unlock rooms, which typically emulate fictional locations, such as prison cells, dungeons and space stations. Long says she was personally fascinated by the lore of the ocean-liner RMS Titanic, which sank in the Atlantic in 1912 after colliding with an iceberg. The scenario seemed ideal for an escape, the themes for which are changed regularly. In this case, players must discover the location of the communication room to send a distress signal to other ships within 45 minutes. 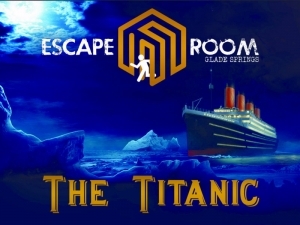 The Resort at Glade Springs maintains two escape rooms, which are open to the public, year-round at its Leisure Center. Teams of up to eight players can participate together at $25 per person. Tickets may be purchased on line at Glade Springs or by calling the resort’s activities concierge at 304-763-0876. Glade’s hotel and conference center provide guests access to three championship 18-hole golf courses on a 4,100-acre property near southern West Virginia’s national parks and Winterplace Ski Resort. The resort includes an equestrian center, an indoor leisure center, full-service spa and salon, world-class fly fishing, boating, miles of hiking and biking trails. The resort’s second new escape-room theme will be introduced in the near future. To stay up-to-date on scenarios, follow Glade escapes on Facebook at facebook.com/GladeEscapeRoom.